With his vintage blaster and signature drumsticks. Born Dirk Steele 35 years BBY. Young Dirk mastered the drums and went on to become one of the founding members of the Correlian punk band "Bantha Poodoo" earning the moniker "Stix." The band eventually fell on hard times and all the members received bounties on their heads for the debt they had incurred. Dirk escaped punishment by faking his own death and taking on the name of Phoenix Darkdirk. Through years of notorious bounty hunting, he has become known simply as "The Phoenix"
This was once the tour bus for the Correlian punk band "Bantha Poodoo" After a hit and miss career of seven years the band finally struck gold with their album "Into the Eye of the Wormhole" which featured the hit single "The Huttz will go Nuttz on yo Buttz" With this sudden success came all the trappings of fame and fortune. With their booking schedule stacking up, they quickly realized that it would soon become necessary to have their own transportation. They pooled all of their advanced gig payments together and purchased a new Correlian model LX-2000 Luxury Passenger Transport and quickly gave it the nickname "Groupie Wagon". Everything seemed to be going well for this up-and-coming band. However, just days before the tour, the drummer "Stix" was fired. The band cited "creative differences" and hastily hired a new drummer to replace him and began their much anticipated four month tour. Unfortunately, while living in the prime of the Empire, (ten years BBY) popularity also comes with added scrutiny. After being on their new tour for only three weeks, the group was forcibly disbanded by the Empire. Their music was deemed "subversive" and all known copies of their work were confiscated and destroyed and their tour bus impounded. With no revenue stream and no future gigs to make the bills, and with prepaid venue owners demanding their money back, the group disappeared into the unending annuls of the one-hit-wonders of the galaxy. Nearly a year later, the original drummer, under a new identity, purchased the tour bus at an Imperial auction. He had accumulated the moneys necessary for the purchase by faking his own death and cashing in on the bounties that had been placed on his former band mates whom he hunted down and turned in. 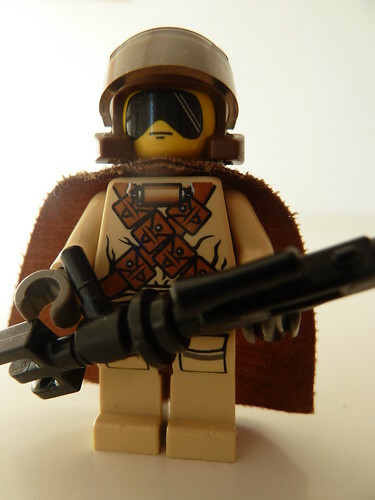 He now travels the galaxy as the bounty hunter known as "The Phoenix." With the help of his pet droid "Hihat" he gutted the luxurious interior of the ship and built holding cells for his quarry. He also boosted the engine power and added turbo lasers and defensive shields. And just for fun, he blares one of the few remaining copies of "Into the Eye of the Wormhole" over the loudspeakers in the cells at all hours of the night to drill his captives into submission. Please visit my Flickr page to see all the detail that these photos don't show. The Retribution is built both inside and out. The interior connects from the forward bridge all the way back to the loading ramps. It is 68 studs long. 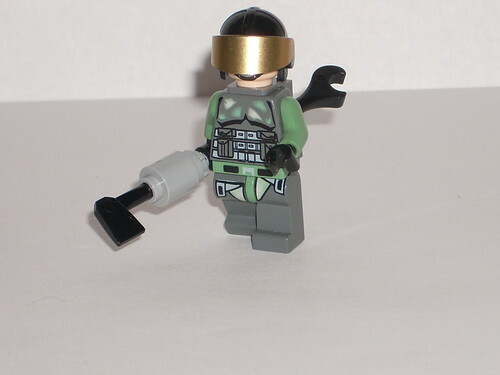 Also, 50 extra points for anyone who knows the origins of my bounty hunter's name. 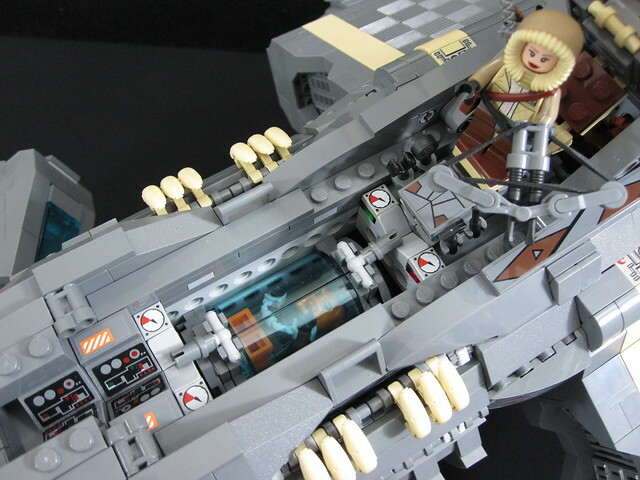 In the second photo, can I include my Sidekick's Speeder? The second picture should just be your ship. When I saw your submission I thought that was attached like a side car, so I didn't say anything. Extra play features like that should be in your additional photos, not the submission pics. The most feared bounty hunter in the quadrant. If you want your bounty alive to torture them yourself, Inca Ter’ is the best, but he will cost you. 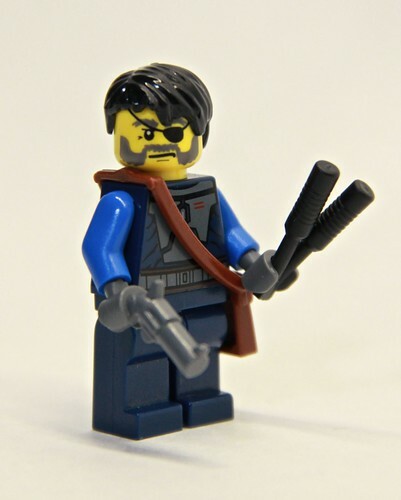 Inca Ter’ carries a long range sniper riffle loaded with enough tranquilizers to knock out a gundark for a week. For close combat he prefers to use his great grandfather’s tribal spear as a bow staff. Inca Ter’s sidekick is known simply as San’Piper. Her weapon of choice is a high power double barreled tranquilizing compound cross bow, as silent as clear night’s breeze. She also carries a double barreled over under repeating blaster for when “alive” is no longer an option. Some poor schmuck that is probably about spend the last days of his life in a lot of pain. Just be glad it’s not you… this time. Eternal Dusk is armed with an array of forward baring armaments stolen from a dozen species in primary wings. The primary wings also house 4 maneuvering sub-light engines. The rear wings house massive sub-light engines slightly over sized for this ship making her a rocky ride but faster then her prey and two small sleeping quarters. The Eternal Dusk boasts a quad barreled laser turret on her dorsal tail. The main cargo hold is equipped with cryogenic chamber. The aft cargo bay houses the maintenance access to the hyper-drive engine. Last edited by Rook on Tue Sep 27, 2011 12:35 pm, edited 1 time in total. pastormacman wrote: Also, 50 extra points for anyone who knows the origins of my bounty hunter's name. Questions like this make me FURIOUS! Last edited by SuperDave on Wed Sep 28, 2011 6:14 am, edited 1 time in total. At least his ship is cool. Shy on details though. Wish we could show interiors in a 4th image. 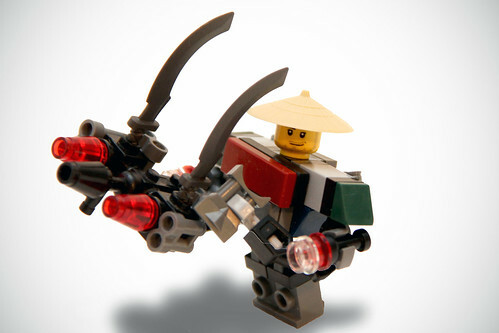 You can link to a gallery with as many pictures as you want, or start a MOC Showcase post of them. Also, quick question: can we keep adding more pics to our linked flickr page as long as we don't make any changes to the model or to the three contest pics? you can do whatever you want to your flickr stream. 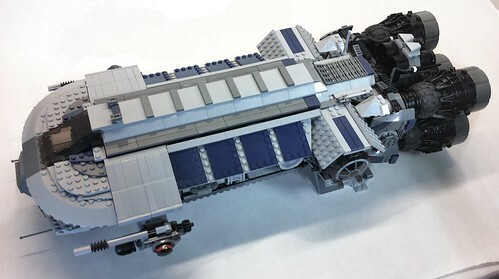 like don said, you can also make a moc showcase post to show off the rest of your work which I would highly encourage. and you can change your entry photos up until the deadline where it will be locked in. 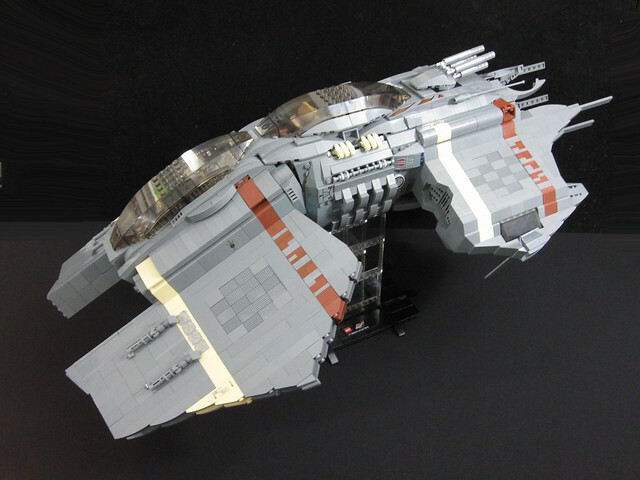 Solo wrote: You can link to a gallery with as many pictures aw you want, or start a MOC Showcase post of them. Ah I feel dumb. Good point, I'll post a thread for it. Nice builds pastor and Rook...I think you have the other entrants thinking now. Daiman wrote: Nice builds pastor and Rook...I think you have the other entrants thinking now. Raskarr the bounty hunter goes by the proverb of, "smile wide and carry a big gun." His ride, the Mythusilosa. Apparently his charming smile can do anything. 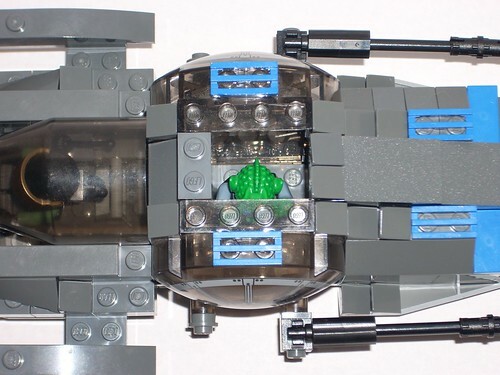 108 studs long with massive shielding and weaponry including a rotating energy shell firing cannon and 34 missiles, he takes out other competing bounty hunters for sport. Raskarr giving a prisoner a talking to. Hope you guys like it! It was a ton of fun to make! Oh, and by the way, I'm 14, I'm not sure if your judging by age but.... yeah. Last edited by Adrian Industries on Mon Oct 03, 2011 3:37 pm, edited 5 times in total. Book Tchassidy and his sidekick Kit Sundancer have been hunting bounty for just about as long as they can remember. You'll hear many bounty hunters described as the meanest, or most deadly, or most feared, or whatever...Book and Sundancer though are just about the nicest bounty hunters you might meet. Book's the ideas man; "Kit, I've got vision and the rest of the universe wears bifocals", and Sundancer has got to be the fastest draw you're ever likely to come across. No really, that guy is Fast. Mental fast. Book boasts that their ship, "The Falling Raindrop" is just about the fastest hunk of junk in the galaxy, that she'll make point five past lightspeed and that he's made a lot of special modifications himself. Mind you, there's plenty of scoundrels and pirates out there who make the same boasts- and Book boasts a lot. 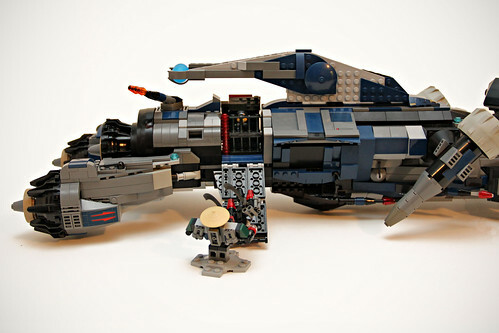 Unlike some bounty hunters, Book doesn't believe in having the biggest, or ugliest, or meanest looking ship. Just something that's fast, that packs a punch when it needs to and that doesn't start ringing alarm bells when it parks up outside the club. You don't want to announce that you're arriving, do you? There's not stacks of room inside, and no pole dancing bar or pub or anything... but it's comfortable enough, and there's plenty of room in the back for a fully contained prisoner. After the fall of the Empire, and the death of Jabba the Hutt, life isn't that easy for a bounty hunter... but Book and Sundancer are just about cunning enough to keep infront. Another good contest fellas- fairplay. And a massive public thanks, and the biggest of love possible, to my gorgeous wife for putting up with the noise of rustling of lego pieces while she has been trying to watch tv for the last month. x x x. sorry. Last edited by captain sambuca on Sat Oct 29, 2011 9:05 am, edited 1 time in total. Alright, to start you off here is my ship. The Ender's Pride. 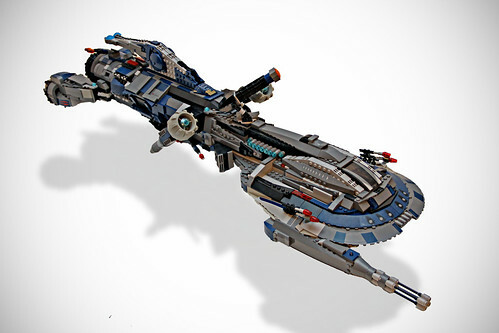 The Ship: This ship belongs to Jaren Haan, one of the most feared bounty hunters . 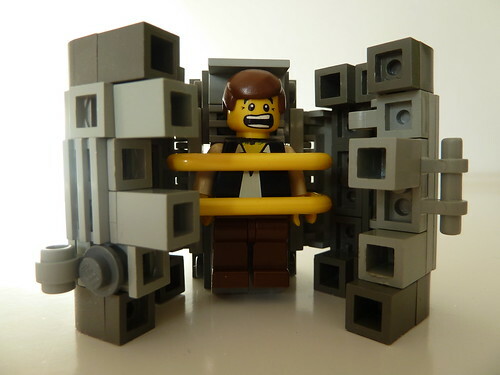 It consists of a hyperdrive and prison cell. It has front forward cannons and backwards blasters as well. 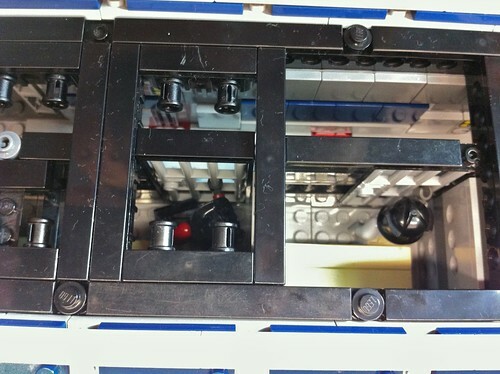 The Cell: This cell that I have is made with two tie-fighter windows and are used to trap a prisoner. Last edited by Captain Flak on Mon Oct 03, 2011 4:00 pm, edited 1 time in total. If you don't got no money, don't buy nuthin'! 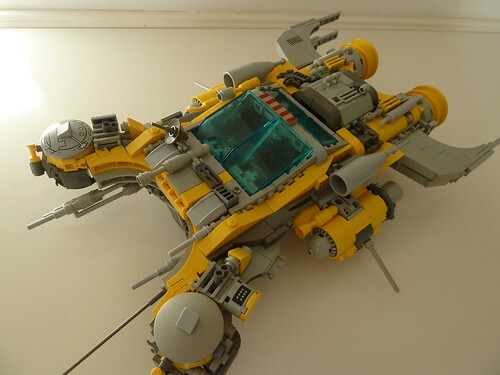 Nice build Captain Sambuca. It has a very "Star Warsy" feel to it. 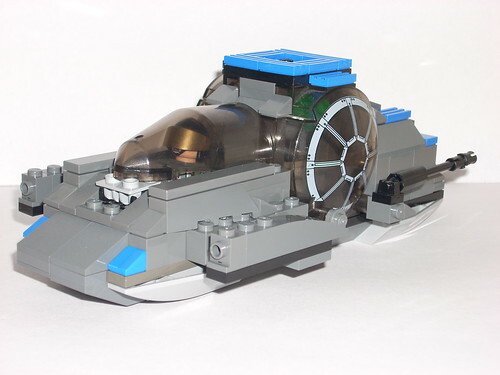 It looks like it was made by the same company that made the speeder Anakin and Obi borrowed to chase down Zam in Ep2. Love the back story too. "Rules? In a knife fight? There's no rules!" Rook yours is very sharp too. Very clean. As far as the picture is, is editing the background allowed? Example: White Background with shadow. So how exactly do we vote? Nice job lads, wishing all bounty's the best of luck! My fbtb name and flicker account are different? is this okay? As here I'm volumex and on flicker I could not use same name?